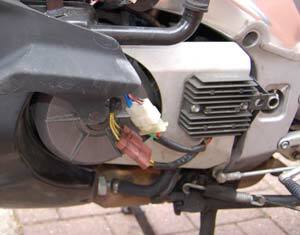 Two words strike terror into the heart of every Aprilia Futura owner: Brown connector. 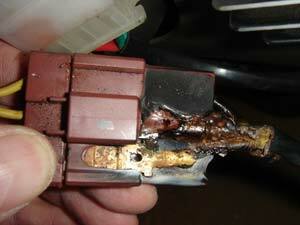 Problems with the brown connector are linked to the charging system and in particular the regulator/rectifier. However, in many cases – if you’re looking at a used bike – the problem will already have been fixed. The brown connector sits in the wiring loom between the alternator and the regulator/rectifier. On some bikes – not all – it has overheated and melted. Failure means a breakdown – sometimes even a fire – so many owners have modified the wiring to exclude the brown connector, and sometimes the white one away from the regulator/rectifier, too. The problem is caused by heat building up in the contacts within the connector, and matters aren’t helped by the poor performance of the stock regulator/rectifier. The connector often fills up with oil which can’t help matters. One theory is that this oil is blown out of the engine casing along the alternator wires. A standard Futura is considered to have a poor charge rate, typically about 12.5 to 13.5 volts at 4,000rpm, and soon after the bike came out owners started modifying the wiring to improve the charge rate. This usually involved removing the brown connector and running extra wires to the battery. This is what’s known as the Wiring mod. See the other links in related pages to the right. However, it should be pointed out that many bikes seem to survive okay without needing any change to the brown connector. But this has to be weighed against the potentially flammable mixture of extreme heat and oil and the consequences should it happen. My personal theory is that bikes used in traffic and/or hot weather all day are especially vulnerable, especially after a friend’s brown connector caught fire in London traffic. Luckily he was warned by a passer by and managed to put out the fire. It could easily have been worse. In late 2010 a poll was set up asking owners about the extent of charging problems on Futuras on the Apriliaforum. Use this link to view the poll for charging problems.